weekend to showcase what is on offer for their visitors from France travelling to Ireland on their holidays. The company were also celebrating 25 years in business selling holidays in Ireland to their small groups and independent travellers from abroad. As the Northwest tourism gains traction in terms of interest from international markets in conjunction with The Wild Atlantic Way concept, there is high demand to offer new packages and Inishowen was chosen as part of their visit as a destination to experience and plan itineraries for 2017. Inishowen Tourism representatives worked closely with Allain Tours to provide them with ideas for the weekend; suggestions to incorporate all attractions around the Peninsula prior to their visit. The company directors Bernard Eucher-Lahon and Corine Ledanois were travelling with their team and Welcome Packs were distributed to their rooms providing them with essential information on everything we offer here in Inishowen. As the trip was time restricted as to what they would be able to visit or participate in during the weekend this would be beneficial for planning itineraries for their clients in the future. The group based themselves at The Malin Hotel; took part in several activity based pursuits, such as the Inishowen Quad Safari experience and hiking the local terrain. They visited the Doagh Famine Village and stopped to sample Kieran’s award winning seafood chowder at Nancy’s Barn Ballyliffin. On Sunday they were accompanied on a guided tour from Malin Town heading north via the stunning scenery around Knockameny Bens, then onto Malin Head. 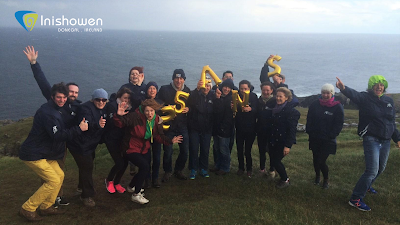 The weather was true to form, sunshine and showers for this time of year, but that didn’t deter the team from Sligo; they were thrilled with the walk along the Malin Head Trail bursting with enthusiasm for the breathtaking views on their way to Ireland’s Most Northerly Point. The group’s last stop before leaving homeward bound was Sunday Lunch at The Seaview Tavern, Malin Head. This was an opportunity to get a little feedback from them in between ordering their meal. Trying not to interrupt their last hour of relaxation spent in Inishowen I requested could they give me a line about what was special, or a highlighted memory from the trip. Someone in the group gave a tagline to capture the essence of the feeling being here and that was it, they all participated writing in my note book their own caption of their individual experience. As their tour bus pulled away I read their captions and smiled, how wonderful to see such comments, these are special and they should be shared with the people and place that inspired these; Inishowen; the wildest elements for the warmest experience; Donegal you have captured my heart; Donegal, real wilderness, real craic; Inishowen is like heaven; Donegal: It has it all; Inishowen, just breathtaking; Live the real life in Donegal; Inishowen: A breath of fresh air; Awesome Inishowen; Inishowen, where you can experience all four seasons in one day; Inishowen number 1; A tiny peninsula, full of surprises. The last caption is my favourite because it encapsulates it all; Inishowen is out on its own; Breathtaking scenery, passionate people, a hidden treasure. As the high season for tourism comes to close, it is time to congratulate all our members and wider community who provide a valuable experience for our visitors whatever they do, it is heart-warming to hear good feedback and we say at Inishowen Tourism “keep doing what you do so well -making Inishowen a truly special place to visit”. I’m thankful to read your article online published on Google connected on blogs post about the wonderfully achievement destination like king of Rajasthan, green valley covered to mountain Kashmir and Kerala covered to snow falling shimla, which are attractive place for tourist parts of unbelievable India? India famous for traditional custom and simplicity a large number of tourists come to India for watching accepted natural beauty of India. Brilliant information on your BlogSpot about Rajasthan and all Destinations online Rajasthan land of king rajasthan despite the fact that its color-charged places throb with the crowds and chaos of growing India, the treasures of the past hold delight of place at heart and spirit There's superb Mehrangarh looming large over sea-blue Jodhpur, the unbelievable sandcastle at Jaisalmer, the palaces of Udaipur, Pushkar's reverent yet carnival attraction, the storybook desire of Bundi and the decorated havelis (ornately furnished residences) spread through Shekhawati. Rajasthan is a land of great monarchs whose experiences of enjoyment and courage are untold. Through this head to package unveiled by brilliant Rajasthan, you can explore the historical luxury of royal Rajasthan when you are offered trips to the many forts, landscapes, lakes and Temples of Rajasthan. The travel plans of Rajasthan organize the trips in a manner that one could benefit from the journey with calmness and not pretty quickly. It offers the major towns of Rajasthan, that have been very regal before as today. The head to includes travel to Jaipur, Bikaner, Jaisalmer, Jodhpur, and Udaipur. Indulge yourself in the bygone age as you find the royal history of Golden Land- Rajasthan. Wow this is feast for travelers. Thank you for the details information. Recently I enjoyed my India tour with Kerala Ayurveda tour. It was a great experience. India with your loved ones. Book your Car Rental in Jaipur with driver, Rajasthan Tour Packages and jaipur sightseeing package now! by tour agencies in Jaipur . Rajasthan is truly worth a visit for all who wish to see India insideout. I want to be victorious over these guys. I will do my best. I really loved reading your thoughts, obviously you know what are you talking about! Your site is so easy to use too. Trinetratours offers best deals on best Kerala Tour Packages. Book Cheap Kerala Tour Holiday Packages in India at very affordable prices. Thanks for sharing info. Keep up the good work...We hope you will visit our blog often as we discuss topics of interest to you Jaipur Tour Package. Well said, I thought i was there while reading your blog. It will really help people to plan their holiday. Keep sharing. Very nice. Thanks for sharing. Crimson holidays are a Bangalore Tour Operators. Yah, I agree with you. You people provided best tour packages to me. Great post. I am getting more interested about it. Rajasthan is considered as one of the most popular travel destination in country. Rajasthan is very colorful place to visit, there are so many forts and monuments. If you want to visit then book a tour package with royal Rajasthan tour packages at very lowest price. Kalinchowk tour Package become Popular due to the recent Cable car facility. Best Kalinchowk tours package by jeep and Cable car. is the best tour Package and has many benefit from religious, Cultural and scenic Views.1 night 2 days Kalinchowk Darshan Package is the best kalinchowk tour package, which is organized by the Green City Travel and Tours(p.)Ltd. Thank you for this wonderful post..
Take leave from a busy schedule and go for holidays to enjoy life. Life becomes beautiful when dream come true, everyone wants to visit the world in his life but they didn't do this for their life because of so many reasons are arrive likes no idea of tour, fear individually but Fenixtours is an international tour operator which visits all over the world and also arranges all things like tourist visa, car rental, hotel, accommodation and much more which have to need to visit. Nice information. Thanks for the sharing. Best Andaman Trip is well-known Tour & Travel Company for arranging best and reasonably priced group tour packages in Andaman. We organize customized Group Andaman holiday tour packages according to the number of travelers included in trip. Our key focus is to provide all comforts and memorable trip to each tourist in the Group. Best Andaman Trip provides all kind of tours such as Group tours, friends group tours, personal group tours, Corporate tour, etc. We arrange Tour to Andaman package in all location of Andaman such as Port Blair, Baratang Island, Havelock Island, Neil Island, Radhanagar Beach, etc.